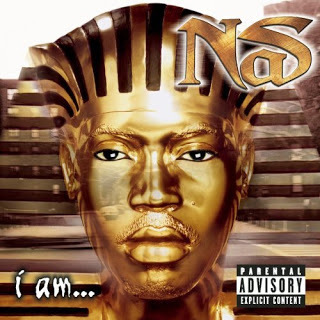 In the next video you see a rapper called "Nas" this person is a friend of Damian Marley the son of Bob Marley they both together made a music album videos with full of symbolism, Marley family also worked with Snoop Dogg another illuminati puppet and they show that they are part of the machine of the music industry of the Illuminati. 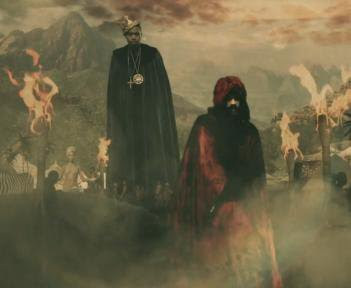 In other video of symbolism, Damian Marley proves that he is an initiate in the cult of magic and the degree mason covered with a red blanket, between Nas and Damian see the spirit of the Illuminati emerging with satanic prayers. 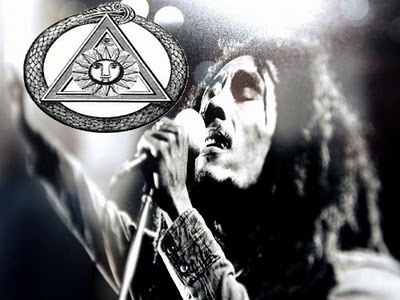 Rastafari It has been suggested that the Rastafari word for god, Jah, comes from the term Jahbulon; Jahbulon (or Jabulon) is a word which was used historically in some rituals of Royal Arch Masonry . According to Francis X. King, it is also used in Ordo Templi Orientis rituals the leadership of Aleister Crowley. I know who it is but if your going to write about it I'll let you find out the old fashioned way... by using research. Ok... I have fully surveyed all of the content on this link. 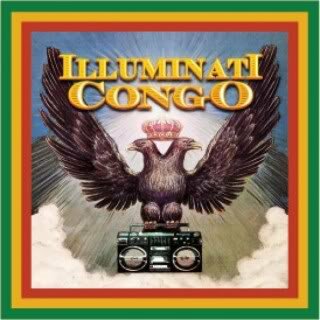 I'll start with Illuminati Congo next. This is a garbage song. Shallow lyrics and no redeeming intellect happening on this track. Is this guy satanic because he's dancing in front of a Masonic Temple? Maybe...maybe not? You don't provide enough content or arguement to prove that. Did he say he doesn't love Jesus or excepted him or asked to be forgiven for his sins? I'm assuming from the tone of this link that you would consider that a requsite. No he didn't. Is he immature and foolish? Yes. That doesn't condemn him though. Jesus healed and forgave people, not smite them. 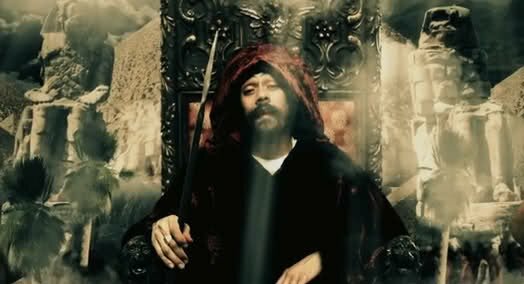 As far as the Damien Marley and Nas video I suggest you start to finally research the subject matter thoroughly...as in maybe find a copy of the actual lyrics to the song if you can't decipher it by ear and try to find a satanic or ungodly reference in its content before you start pointing fingers. A red robe and a pyramid? That's guess work at best and a strawman arguement. The lyrics in this song are completely humanitarian and truthful. I suggest you go back to the drawing board before you embarass your credibility any further. As for Jay Z he's definately satanic, masonic and all that. His lyrics and imagery prove that time and again. My point to you is you cant just lump all these artists together. By doing so your being a shill. 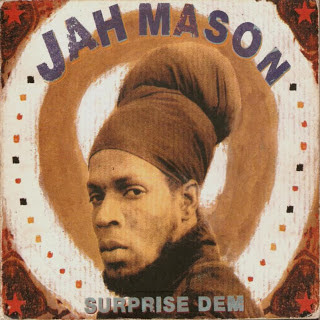 Also... Jah Mason?... ummm?? Is his name Mason or is he a mason? You provide no pertinent information for anybody to make an decision about that so I will neither comment on that or take your word for it as your word or facts haven't reached the threshold of what can be defined as truth. Did you want to be rich and famous??? bytoday for your heart desire to come to pass. This is a great temple of the Illuminati were you find, POWER, RICHES, FAMOUS, WEALTH, if you want to get rich quick and be famous"you need to cross your heart and do what is in your mind, are you a business man or woman,i want to share on how i belong to Illuminati member, a friend of mine that always give me money because he was very rich, one day he said he is not going to give me money,and how to fish that he is going to teach me how to fish, so i was very happy, i never new he was a member of Illuminati all my life will spend together! so i was initiated to the Illuminati world and few days i was awarded a contract worth of millions of Dollars, in my business i am doing very well right now,i am now the one that give money out before it was heard, if you want to belong to us email us on:greatillumintitemple@gmail.com do you want all your dreams to come to pass? Are you an upcoming artist? dancer? businessman? etc the Great Illuminati Society offers you a life time opportunity of making your desires come to accomplishment. If you are interested in being a member please contact us online via email>:greatillumintitemple@yahoo.com or call me on this Mobil number:+2348163387496. Greetings to every one that is reading this testimony, I am giving my testimony, because my life is change for good, i am rich and successful in my life, i was totally frustrated with the people i believe they can help me but nobody was ready to help me, i was called nobody in my family, I was tired of asking people for help because they are not ready to help me, i see people around me getting rich, living a good life, happy with they family, but to me i was so ashamed of my self, i always ask myself how can i become rich and successful in my life, because i see nobody helping me, i want to a shopping-mall to see people and sit down and think of my life, when i was sitting a man close to me said, what is your problems young man, i was carried away because i think of so many things, the man said again young man what is your problems, them i asked i have nobody to help me, i am totally frustrated, the man asked me that i am ready to help you so he told me something, that if i would like to join the illuminati brotherhood, and i think over it though out the day so the next day i looked up and i keep repeating what he said to me, them i make up my mind to join the illuminati brotherhood, since i joined the illuminati brotherhood i am so proud of myself living a good life, well know in the world rich and famous, if you are interested to join the illuminati, you are free to join, if you live in America it is free to join the illuminati brotherhood, email: churchofdevilinitiationcenter@gmail.com you can call or text +15088192672 to join the illuminati brotherhood and become successful in life. Paul Smith is my name, I am here to tell the world that the Illuminati is real and true. This was how I became a member of the brotherhood of illuminati. I lost my dad when I was 18 years old and my mum at 19 so life was terrible for me and I don’t know what to do anymore so a friend said he will introduce me to some sort of association that can make me extremely rich and wealthy also with protection so I begin to wonder how can that be done he introduced me to a member of the illuminati and I told them I wish to join. So I was initiated and I became a member of the brotherhood of illuminati when I was 22 years old and now I am 48 years old on my induction ceremony day I was given $2,000,000.00 and after that I been paid $80,000.00 per month I have so enjoyed the brotherhood I am rich today just because of the brotherhood and I have been made an agent to tell the world to come and join us, so to enjoy the benefit of living. So if you want protection, fame, wealth ,what have you just name it; the brotherhood of illuminati can make you achieve your dreams join us today our official number is +1(617)663-8926 you can call or text, also you can email us on illuminatikingdom56@gmail.com you are all welcomed. Become a member now and get instant benefit of $2,000,000.00. I am a very happy person today because i am now a full and bona-fide member of the great ILLUMINATI. I want to quickly Say a big thanks to Brother James Watt the agent of the brotherhood who introduced me to becoming a member of the great Brotherhood brothers and sisters here is my story. I was told by a friend that to become a member of the brotherhood is Very difficult, so i was thinking that i can never get the right link to join because i was scammed by three people whom i meant on the Internet and they promised to help me join but they never did. They collected my money and i was never initiated into the brotherhood. Until i was introduced to Brother James Watt and he told me the truth that those in USA Don’t pay any money from their pocket to become a member of the Illuminati, and i am an American. so i was very Interested i called the temple messenger number i was given it was +1(508)834-6121 when i called, the temple messenger Told me what i need to do, i did it and i was initiated i did not pay a dine from my money to become a member. But i was told that those living outside USA may have to do certain things for the purchase of their initiation materials. But those living within the square of USA don't pay a dine. I followed all instructions and after my initiation, I was given all the benefit of becoming a member. As i talk to you am very okay and my future have been settled. I am well protected and i am wealthy and famous. Please if you wish to become a member of the great Illuminati contact Agent Brother James Watt on the Devil Church, (illuminatikingdom09@gmail.com) or those in the USA can call or text directly the Temple messenger on +1(508)834-6121. Those in other countries outside the USA can contact the international agent on call Or WhatsApp +2348146942481. And generally anyone who wishes to become a real member can send email to (illuminatikingdom09@gmail.com) Become a member today and enjoy the benefit of life. Raul Mark Rosgate is my name and i live in Boston USA. I want to quickly tell the world how I became rich with the help of Illuminati. It came to a stage where things was very rough for me even to eat three square meal was a big problem for me so I thought right from time that to become a member of the illuminati is never possible for a poor man like me because all those I know that belongs to the organization are very wealthy and also rich. Although I had always wanted to become a member but was afraid to say it out because of my poor background. But when I lost my parents I was totally down and fraustrated, and therefore I needed to be rich. So I did some researches on the internet and I found a name called Wilson Mills he said he’s an agent of the illuminati so I tried to contact him and again I was afraid that I would be asked to pay money to become a member but behold I contacted agent Wilson Mills and he told me that becoming a member of the brotherhood is totally free of charge that no one pays a dine to become a member when I heard this I was so happy and I signified my interest immediately. So he directed me and gave me official number of the temple messenger so I called the temple messenger on this tel +1 (202) 798-6635. The temple messenger gave me the official email and asked me to email the illuminati official email illuminatikingdom666@iiiha.net so I emailed and then I got a response. to cut the long story short I was initiated free of charge and I became a full member of the brotherhood of illuminati. On my induction date I was given two million US dollars and I am been paid on monthly basis. As I write this message now I am very wealthy, I now ride on a limousine and also my future is secured. Infact money rules the world. Please if you want to be rich and wealthy, or you are already rich and wealthy but you want a secure future for you and your generations to come, I implore you to become a member of the illuminati today and let your dreams come true. To become a member, text or call the temple messenger on +1 (202) 798-6635 or email illuminatikingdom666@iiiha.net life is sweet when there’s money. I am a very happy person today because i am now a full and bona-fide members of the great ILLUMINATI. I want to quickly Say a big thanks to Brother Kenny west the agent of the brotherhood who introduced me to becoming a member of the great Brotherhood, brothers and sisters here is my story. I was told by a friend that to become a member of the brotherhood is Very difficult, so i was thinking that i can never get the right link to join because i was scammed by three people whom i meant on the Internet and they promised to help me join but they never did. They collected my money and i was never initiated into the brotherhood. Until i was introduced to Brother Kenny west and he told me the truth that those in USA Don’t pay any money from their pocket to become a member of the Illuminati, and i am an American. so i was very Interested i called the temple messenger number i was given it was +1(508)966-8028 when i called, the temple messenger Told me what i need to do, i did it and i was initiated i did not pay a dine from my money to become a member. I was given all the benefit of becoming a member. As i talk to you am very okay and my future have been settled. I am well protected and i am wealthy and famous. Please if you wish to become a member of the great Illuminati contact Agent Brother Kenny west on the Devil Church. Are you having the dream of becominig a member of illuminati? Are you a man or woman business man or business woman or an artist,Politicians and you want to become big, Powerful and famous in the world, join us to become one of our official member today in the great illuminati,you shall be given an ideal chance to visit the illuminati and his representative after registrations is completed by you, no sacrifice or human life needed, Illuminati brotherhood brings along wealth and famous in life, you have a full access to eradicate poverty away from your life now. it only a member who is been initiated into the church of illuminati have the authority to bring any member to the church, so before you contact any body you must be link by who is already a member, Join us today and realize your dreams. we also help out our member in protection and links in drugs pushing and other businesses for fast wealth without risk,email us illuminatiworldriches2@gmail.com, you will be rich and famous for the rest of your life and your family and any body close to you, illuminati make there member happy so i will want you all to also be a new member of the illuminati if you are interested, urgently reply us back now, we are ready to make you a member of the illuminati..after the due consultation and initiation that will make you a full member has been taken place,you will be given 1 million us dollar for a start of a life filled with happiness,pleasure ,talisman will be given to you after initiation power and wealth will be yours forever, email us; illuminatiworldriches2@gmail.com.